We all know the Can-AM X3 is one of the most popular UTVs on the market. From the base model to the Turbo R models, the X3 offers nearly everything you could ever want from a UTV. Unfortunately, the X3, like all vehicles, is built to a cost. 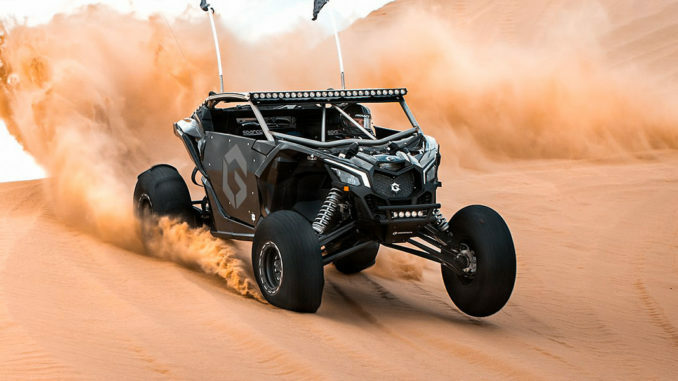 Can-AM spends the bulk of the money building X3s on the chassis, suspension, and engine. Things like how bright the head lights are is a complete afterthought. If you are somebody who likes off-roading after the sun goes down, aftermarket lighting is an absolute must. The world of LED light bars is very big and many of the products seem identical on the surface, but in this short guide we will look at tons of different Can-AM X3 lights and help you find the best one. We’ll cover everything from LED light bars, brackets, mounting systems, wiring, and more. One of the most popular ways of mounting a light bar to an X3 is on the roof. The OEM roll cage provides a very strong location to mount your lights to. By mounting the light bar on the roof, you reduce the amount of shadows created from the light, making it easier to go fast because you can judge the size of bumps in the road better. Just like in our other LED light bar buying guides, we strongly recommend purchasing a high-quality product compared to some cheap Chinese product. We’re starting this list out with what we believe to be the best Can-AM light bar on the market. If you’re more interested in a low-cost product, we have products listed further down which might be better for you. Baja Designs has long been one of the biggest names in the LED light bar market. They focus on building single row LED light bars, with an emphasis on quality optics. Without quality optics, the light emitting from the LED diodes will not be projected far down the trail where you need to see. How you use your Can-AM will ultimately determine which specific OnX6 light will be best for you. Baja Designs offers straight and curved variants, with some using amber optics to help cut through the dust if you’re following someone else at night. The specific light we have linked below is a OnX6 40” Straight with Can-AM X3 brackets, making it very easy to mount this light to your X3. Next up on our list is the 40″ Rigid Industries Pro Series. This light bar is a bit more expensive than the Baja Designs light, but offers a unique and awesome looking all black design. This light bar uses a curved design with spot projectors to help project the light further down the trail where you need it. This light is perfect for anyone who doesn’t like the shiny design of a standard light bar, but still wants the best quality product possible. Outputting a total of 35,640 lumens at 275 watts, this light bar is a bit brighter than the Baja Designs light, however, it uses more power. Unfortunately, there is no kit for this light bar which includes Can-AM X3 brackets, but we listed brackets further down this list which will work for this light bar. Just like any other Rigid Industries light bar, this light is IP68 water proof and backed by lifetime warranty. Designed, engineered, and assembled in the USA, you know you’re getting a high quality light with this light bar. For those who want a modular light bar which can be re-purposed as smaller individual lights, the KC HiLites Flex Series is the perfect solution. This light might not have an insane output of a Baja Designs or the awesome looks of a Rigid Industries light, but it offers a unique ability that no other light bar on the market can. The Flex Series is essentially an array of smaller lights which are bolted together and can be broken down into two arrays of smaller lights. Another awesome feature of this LED light bar is the small form factor which looks great on a small vehicle such as the Can-AM X3. Output for the 40” Flex Series Array is rated at 19,500 lumens. Just like the other two high-end lights on this light, this LED light bar is IP68 water and dust resistent. If you can manage to break this light, KC will back it up with their 23 year warranty! For those who want a middle of the road product, this light bar from Auxbeam is perfect. In the past, we’ve used Auxbeam on our personal vehicle and know their products very well. They’re a far cry from something like a Baja Designs or Rigid Industries light bar, but they’re much better than the typically cheap Chinese LED light. Auxbeam’s 5D series, in particular, projects the light down the trail much better than any other cheap light bar. If the light isn’t projected far enough, you’ll end up driving faster than you can see and end up in a bad situation. This light bar from Auxbeam has a claimed output of 24,000 lumens, however, this number is just an estimate and does not represent the true output of this light. That being said, this light will be more than enough for some light off-roading and trail riding. The brackets that ship with all LED light bars are designed to be universal. The problem with universal brackets is the need to drill giant holes in your roof, body, or roll cage. By using vehicle using vehicle specific brackets, you’ll end up with a much cleaner and better looking install, plus the light bar will have a stronger foundation and thus have less chance of moving around. Although roof mounting might be the most popular place for an LED light bar to mounted on a Can-AM, not everyone wants a giant light bar on their Can-AM. If you want to mount a smaller light bar to your Can-AM, the shock towers present an excellent mounting location. This kit from Baja Designs offers a 10″ OnX6 LED light bar with a simple mount that bolts to the shocks mounted. The light bar is positioned right above the hood and does not obstruct vision in any way. This kit is a little pricey, but it offers a simple bolt-on solution with a very powerful little light. For those who want a shock mount kit without the high cost of a Baja Designs light bar, this bracket from UTV INC is the perfect solution. These simple brackets work the same way the Baja Designs bracket works, but without the light bar. The brackets are designed to accept any 10″ LED light bar, leaving the choice to you.